New Animals, by Nick Francis Potter. Denver, Colorado: Subito Press, April 2016. 250 pages. $18.00, paper. New Animals is comics. It is short stories. It is the dreams and nightmares of various horned creatures, of children, and of angels. As its name suggests, New Animals is a living, breathing creature, each short piece another row of razor-sharp teeth. 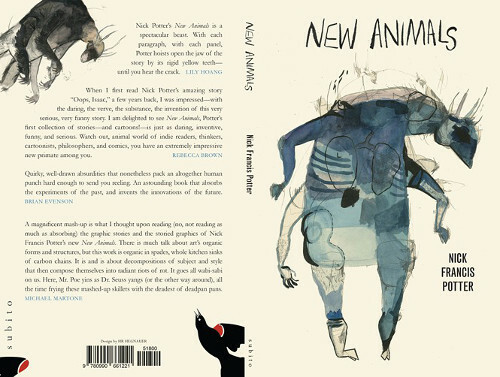 On the book’s backside, author Lily Hoang has this to say about Nick Potter’s debut collection: “New Animals is a spectacular beast,” but such a short blurb cannot do justice to such a well-rounded collection. This review, in fact, cannot do justice to New Animals. No, the book bellows, it roars and begs to be picked up and brought to love seats and tree branches and beds, waiting to sink its fangs into the next reader and leave its wonderfully bizarre mark. New Animals is split into thirteen pieces: five short stories, composed wholly of prose; four comics; and four stories in which Potter slips seamlessly from prose to comic form and back again. These are stories and comics about murderous sons and an axe-wielding fox. About existential thoughts and piecemeal high school football stars. About religious figures and cattle and moose-like equipment. On their surface level, these stories are funny and absurd and whimsical, but often darkness surges just below, and this is what sets Potter’s work apart from other contemporary writers of fabulist fiction. Or, consider “Josh Henderson Is Anne Boleyn,” in which we follow the Henderson children, and particularly Josh Henderson, as he playacts as Queen Anne Boleyn. His sisters give him three days in which they will follow any of his commands. The game seems amusing at first—a brother given control of his sisters, but as the story continues, and after a series of miracles—whether imaginative or supernatural we are left unsure—the sisters bring their brother, their queen, atop a slide and loop a noose around his neck, preparing to hang him. If you want specifics I’m saying Herbert 2b specifically about marriage with a girl getting married to equipments. Sven rearranges when, docile, he falls under Beth’s palm-heat, afterward expanding with head-weight. But getting wind in your ears is, they agree, silently, what it is we said it was. Part of the fun of reading New Animals is deciphering these lovely tongue-twisters, and once unraveled each story or comic becomes even more complex than it already was, textured with these wound up bits of language. To praise Potter’s prose alone, though, would be a misstep, and his blending of word and image propel New Animals above and beyond mere graphic novels or short story collections. So it’s only right to acknowledge Potter’s fantastic art style. Potter sets the precedent with the collection’s cover art, a four-armed horned beast delivered in washed out blues and grays, sharp lines of black defining the beast’s lungs and neck and legs. Though Potter’s interior illustrations lose the color found on the book’s cover, they lose none of their beauty. In fact, once Potter’s watercolor washes become grayscale, the illustrations take on a sense of the Gorey-esque, and this is especially fitting for these renderings of the bizarre and macabre. And yet, Potter’s illustrations retain the same whimsical nature found in his prose. One comic in particular, the collection’s closing piece, stands out as an especially powerful use of image. In “Conrad Dillinger’s Inevitable Death,” the comic’s protagonist, Conrad, contemplates his death over thirty-four pages and three hundred and six panels. The comic is a masterful use of minimalism, and as the narrative moves on we start to see Conrad as a grotesque until he disappears altogether, leaving two full pages of blank panels. It’s a truly haunting portrayal of an age-old existential question. I read New Animals in a single night, and then I read it again soon after. It’s a book with claws and teeth and a heartbeat and, as the cover suggests, a pair of lungs capable of breathing. These lungs, prose and comic, image and text, are what makes Potter’s collection feel so wonderfully alive. Whether in its whimsy, or its riddling language, or its art bordering on the gothic, Potter has established his place in contemporary fiction, and we can only hope he unleashes more of his creatures to the world.